Rat problem is a real annoyance to most homeowners in rural and urban areas throughout the world. If you want to get rid of rats applying fast, hands-free, green and non-toxic methods, you may use modern electronic rat traps. They are more humane alternatives to traditional mechanical snap traps. 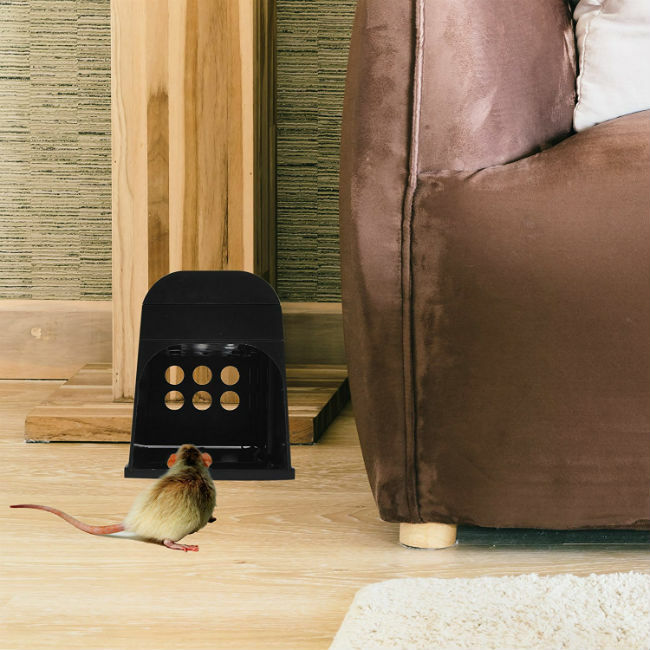 The most popular electronic rat traps are Victor Electronic Rat trap, PestZilla Electronic Rodent Trap, Rat Zappers classic rat trap, PestNoMore Rodent Zapper, Hoont Robust Electronic Rodent Trap, Raticator S-Plus Rodent Zapper, SereneLife rat and rodent trap, Eliminator electronic rat and rodent trap. These traps are ideal for basements, cellars, attics, garages, shops, hotels, warehouses and sheds. However, Rodent Terminator Electronic mouse and rat trap by RodenTerminator can be used outdoors as well. You can purchase any type of rat zapper on Amazon, eBay and at the nearest home depot. The bait placed along the back wall of the trap, lures the rat inside and onto the metal plates. Its advanced smart circuit technology senses the rodent that enters the trap and instantly delivers approx. 7,000 volts of electricity for two minutes. The poor critter dies immediately without suffering. The electronic rat trap may kill up to 20-50 rats per set of 4 ‘C’, ‘AA’ or ‘D’ batteries (not included). Any type of electronic rat trap is easy-to-set and apply. First, put on chemically resistant or protective gloves to avoid leaving your scent (it may deter the pests). Then, insert four ‘C’, ‘AA’, ‘D’ batteries into the battery compartment replacing the cover or plug in the device with the provided adapter. The trap will exterminate approximately 15 – 50 rats on one set of 4 batteries. Third, apply a small amount of a rat snack with a toothpick or Q-tip through the hole in the back wall of the trap. The best baits are peanut butter, english muffin, slim jims style jerky, sunflower seeds, dark tuna meat, dry pet food. Place the baited electronic rat traps in the areas of rodent activity. Due to the fact that brown and black rats typically travel along the edge of a room, the traps should also be placed on a flat surface against the wall or along baseboards with the bait side closest to the wall. At last, turn the main switch ‘ON’. A green light on top of the trap will blink once and a short buzzing sound will be heard to verify it’s working. After kill, the indicator light blinks green for up to 24 hours to signal that a pest is in the trap. When the batteries run low or need replacing, the light will blink red. Note that all electronic rat traps are reusable. Thus, safely discard the dead rodent directly into the trash simply tipping the box. Don’t touch the corpses as the rats are vectors of diseases. Then, reset the trap. Easy to set, bait and kill pest rodents. Traps are safe to use indoors without making harm to humans and pets due to the built-in safety switch and beveled tunnel design. Eco-friendly and non-toxic. You don’t need chemicals or poisons to kill rats and mice. Washable, durable and reusable. No blood, no mess, no smell after the rat being zapped. The special kill indicator notification will signal you when to dispose of the corpse. Effective, humane and quick. Pest rodent is zapped instantly when it enters the trap. Quick death without torture. Unfortunately, you can’t use electronic rat traps outdoors as rain and snow may damage the mechanism. However, there is the Rodent Terminator rat trap that has a special weather-proof design for application anywhere inside or out. On the other hand, you may use protective containers, or bring the common zappers inside, or cover them with water-proof shed or boxes before it starts raining. Use the electronic rat trap as directed in the product label. Inappropriate application may cause electrical shock or serious injury. Never use product around small children, small household pets, life support devices and combustible materials. Don’t bait the trap with food or pet kibble that dogs and cats like. See product warning for additional information. Always use protective gloves while baiting, installing and cleaning up the electronic rat trap. Leave the rat zappers switched off for several days so the rats get used to their new food source. Then, turn them on and you will definitely find dead rats next morning. If rats that enter your home are very inventive at licking or grabbing the bait from the airholes in back, simply take a metal box or plate and block the holes. Thus, the rats will have to enter inside to get the food. Always make sure that a rattrap is off when you handle it. We recommend taking batteries out to wipe the inside out with a paper towel. Never use any cleaning agent, just slightly damp almost dry paper towel. Some traps are washable, read the product label for additional details. Mark the “ON” position with a spot of paint so it’s easy for you to make sure you have the switch in correct position if the inscription is likely to wear away or you don’t understand the |/0 symbol on the switch. Electronic rat traps help exterminate all types of rats and mice that annoy you during the nights. No blood, no damage, no smell and no scream as the kill plate zaps immediately leaving no chance for the rodent to escape and survive.